Black Friday - 30% off all my prints and calendars. Use code blackfriday to get your disount at shop.dragarta.com/ on November 23-25. Some of you probably know that I am running the group here on DeviantArt. 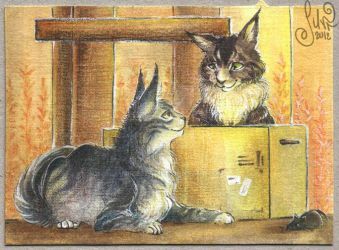 This group is for artists interested in trading original ACEO/ATC cards with all kind of animals and anthros. Group's history is very long, we've started trading in November 2006 through Livejournal and since the time we've connected many artists from all around the world! Unfortunately from time to time I have problems with pairing new couples for our trades. It's mainly because some of our fantastic members have participated so many times that it's problematic to find someone new for them. It would be great to add some new souls or encourage older members to participate again. If you find this group and trading ACEOs interesting, feel free to hit the Join button to take a part (: But please keep in mind that our group has a quality control so we will review your art skills and let you know in a few days (take a look at our gallery to get a better idea). It would be also great if you could spread a word about our ACEOfursXchange group or tell your friends. Hey! My name is Lucie Kostkova and I am freelance graphic designer and illustrator from Czech Republic. My biggest hobby has always been drawing and various creative activities, which I present in web galleries since 2005, and since then I also use the nickname "Dragarta". Currently I live and work in Prague with my husband and our four-legged meowing companions Kraken & Indy.